Children with eczema are more likely to be diagnosed with attention deficit hyperactivity disorder (ADHD) than those without the itchy skin condition, according to a study. TUESDAY, Feb. 17, 2009 (Health.com) – Children with eczema are more likely to be diagnosed with attention deficit hyperactivity disorder (ADHD) than those without the skin problem, according to a study. The children in the study had atopic eczema, a scaly, itchy skin rash that is typically caused by allergies and is common among infants. The rash often improves as a child gets older, although it does signal an increased likelihood that he or she will go on to develop allergies, hay fever, or asthma. German researchers spotted the link in a study of 1,436 children and adolescents aged 6 to 17 who had atopic eczema and 1,436 young people without it. They found that 5.2% of eczema patients had been diagnosed with ADHD, compared to 3.4% of eczema-free youngsters, according to a research letter in this week’s issue of the Journal of the American Medical Association. Young people with atopic eczema were 54% more likely to have an ADHD diagnosis than those without it. And the more frequently they had visited a doctor for eczema, the more likely they were to have been diagnosed with attention problems, say study coauthors Jochen Schmitt, MD, a dermatologist at Technische Universität in Dresden, and Marcel Romanos, MD, a child and adolescent psychiatrist at the Hospital Clinic of the University of Wuerzberg, both in Germany. 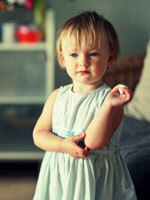 About 20% of children in Western nations are diagnosed with atopic eczema by age six. About a third of those children go on to be diagnosed with hay fever or asthma. Next page: Can a child's diet affect ADHD symptoms? However, the link needs to be confirmed by additional research, they said. It’s possible that eczema-related itching or sleep disturbances may exacerbate ADHD symptoms in some children, the researchers suggested. It’s also possible that atopic eczema and ADHD could share an underlying cause. “It is important to note, however, that this finding might only be relevant for some and not all children with ADHD,” the researchers said. Special diets (for example, regimens that eliminate food additives and sugar) have been proposed for treating ADHD, but the role of diet and food sensitivity in the condition has been highly controversial. No high-quality studies have been able to show that changing a child’s diet has any impact on ADHD symptoms, notes David W. Goodman, MD, an assistant professor of psychiatry and behavioral sciences at the Johns Hopkins University School of Medicine in Baltimore. “The report adds additional circumstantial evidence to our hypothesis” that immune-system factors are involved in ADHD, according to Jan Buitelaar, MD, PhD, of Radboud University Nijmegen Medical Center in Nigmegen, The Netherlands. Dr. Buitelaar was not involved in the current study but coauthored a 2008 paper suggesting that ADHD may be an allergic condition in some patients. “There is data that allergic mechanisms could alter brain neurotransmission and brain functioning,” Dr. Buitelaar noted via email. He also pointed out that children could develop “disruptive and restless behavior” as a result of the itchiness and pain caused by the skin condition.